It is standard operating procedure for Republicans to create one bogeyman after another to keep low-information social conservatives in line. The latest is Planned Parenthood. 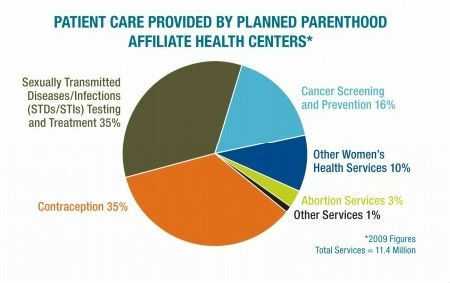 The chart shows the services Planned Parenthood centers around the country provided in 2009. 3% of those services were abortions, while 97 percent were STD tests and treatment, contraception provisions, cancer screenings, and other women's health services. Abortions represent a tiny fraction of Planned Parenthood's budget and none of them are paid for with federal funds. Senator Jon Kyl's claim that abortions are "well over 90 percent of what Planned Parenthood does" was pure mendacious pandering. His spokesman later said that Kyl didn't intend to be "factually correct." Say what? I guess the Senator thinks lying to the public is okay when you're trying to create yet another social conservative bogeyman. Republican's in Congress, who pressed for stripping Planned Parenthood of all federal funding, would not stop any abortions, but would certainly stop poor women from getting the cancer screenings and access to contraception they desperately need. Pandering of this issue by the candidates for the Republican nomination is equally unhelpful and hypocritical.